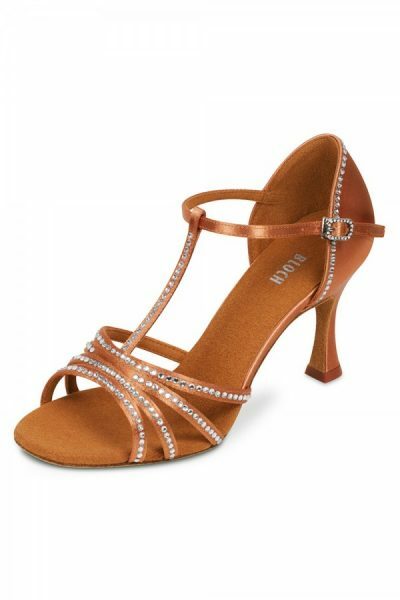 The Bloch Guilia Tan Latin Dance Sandal is a stunning T-bar shoe with a 2.75″ flared heel. This elegant sandal is particularly popular with our Salsa and Bachata dancers. The Bloch Guilia has a T-bar design decorated with diamantes on both the front straps and heel counter. 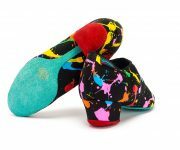 The shoe comes in a regular width fitting but a Bloch fit is a generous one and is therefore suitable for a wider foot. The open toe design gives the shoe both elegance and finesse with the T-bar providing maximum support. Hidden quick fit buckle to allow swift fastening and unfastening of ankle strap. Flexible sole to allow the foot to fully point and flex. Suede sole for perfect spins, slides and turns on all indoor dance floors. Padded insole for extra cushioning and comfort. PLEASE NOTE this shoe is currently unavailable in certain sizes and this is reflected in the “Shoe Size” drop down menu.